The authors of this book have made an in depth study of the strategies and management practices of leading media companies and have identified the core competences media companies need to have to win in the new world. The book is strongly focused on applicability and combines long standing best practice principles with innovative approaches for staying ahead. It systematically discusses competences needed in each of the key functional areas in the media companies drawing on examples from all main media sectors. Annet Aris, Adjunct Professor of Strategy at INSEAD, Fontainebleau, and former partner at McKinsey & Company. Dr Jacques Bughin is a director at McKinsey & Company, and academic Fellow at ECORE as well as at the Katholieke Universiteit Leuven (KUL). Both draw on a long and broad experience of working in, and teaching on, the media industry. Media: One or Many Industries? Focus and Scope of the Book. CHAPTER 2: Rebalancing the Media Value Chain. Current Practices Mostly Historically Grown. Consequences for the Management of Media Companies. Is a Fundamental Rethink of Future Business Models Needed? Case Study: The Welt Group: Creating New Business Models For News Provision. Case Study: Hubert Burda Media: In Search of New Digital Business Models. Case Study: Mediaset: From Focused Broadcaster to Value Chain Operator. CHAPTER 3: Creating and Leveraging Innovative Content. Future Role of (Blockbuster) Content. Management of the Content Generation Process. Peer Production, User-generated Content and Co-creation. Case Study: Endemol: Diversifying the Content Portfolio. Case Study: OhmyNews: Creating a Sustainable Model for Content Co-creation. CHAPTER 4: The Fight for Customer Attention: Intelligent Mass Marketing and Cautious Niche Strategy. The Increasing Need to Understand Customers. Fine-Tune the Marketing Strategy to Revenue Model. Marketing Strategies for Subscription-based Players. Marketing Strategy for Niche and Thematic Offerings. Case Study: EMI: Developing New Marketing Models for the Digital Age. Case Study: Telenet: Leveraging Digital Segmentation. CHAPTER 5: End-to-end Supply Chain Management. Achieving Operational Excellence in Supply Chain Management. Enhancing the Effectiveness of Standardized Media Supply Chain Processes. Improvement Levers for Non-standardized Processes in the Media Industry. Managing the Transition to Digital Platforms. Case Study: RTL Group: Creating a Digital Value Chain. CHAPTER 6: Ways Out of the Advertising Commodity Trap. Traditional Advertising Under Increasing Pressure. The First Wave of Advertising Spending Shift: Direct Marketing and Below the Line. Digital Technology at the Core of the Second Wave. Reaching New Capabilities in Advertising. Case Study: Schibsted: Diversifying the Advertising Source. CHAPTER 7: Corporate Strategy in Media. Case Study: Liberty Global: Multichannel Portfolio Play. Case Study: Lagardere Active: Restoring Growth Through Operations. Case Study: Sanoma Group: Restructuring the Portfolio for Growth. CHAPTER 8: The Future Role of Online Media. Online Start 1995--2001: 'Overestimate in the Short Term'. Period of Consolidation 2002 to 2008: Building the Digital Platform. Case Study: Second Life: Peer Production Through Co-creation. Case Study: YouTube: Building Social Media. 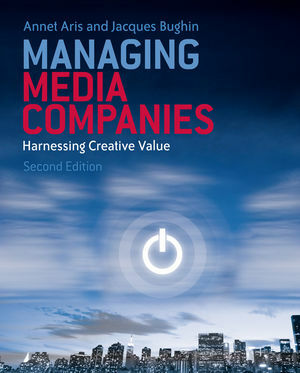 CHAPTER 9: People Management in Media Companies: Creative Managers or Managed Creativity? Current People Management Practices in the Media Industry. Current Challenge:Embrace 'Creators' Yet Do Not Understate 'Transformers'. People Management in the Digital Media Era. Case Study: BBC: Adapting the Organization to the Digital World. The chapters will be fully updated to reflect the recent changes that have occurred in the media industry. Brand new content will be added into chapters 2 and 8. A brand new section focusing on all aspects of developments and the management of multi-media. Includes unique research done by McKinsey and INSEAD on topics such as digital contents and services, web 2.0 technologies, digital marketing practices, virtual worlds, broadband TV and mobile video. In depth discussions of the current and new skills media companies will need in order to succeed i.e. innovative content creation, gaining and keeping customer attention, end-to-end digital supply chain management B2B marketing of advertising opportunities and creative people management. Insights into best practices from traditional and new media as well as media and telecommunications convergence.